The earnest words of the big fella carry a lot of weight on “Bless My”. Click here to listen. 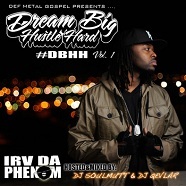 Fans of Scoob’s work with Irv Da Phenom can check out more music on Big Scoob’s Damn Fool. The album features Irv Da Phenom along with Tech N9ne, Glasses Malone, Krizz Kaliko, and Bumpy Knuckles. Click here to pre-order Damn Fool now!